The sea buckthorn shrubs in my neighbourhood are heavy-limbed with bright orange, sweet-scented berries right now. The harvest looks more abundant than I’ve ever seen before – it must be partly due to the higher-than-usual rainfall we’ve had this summer. 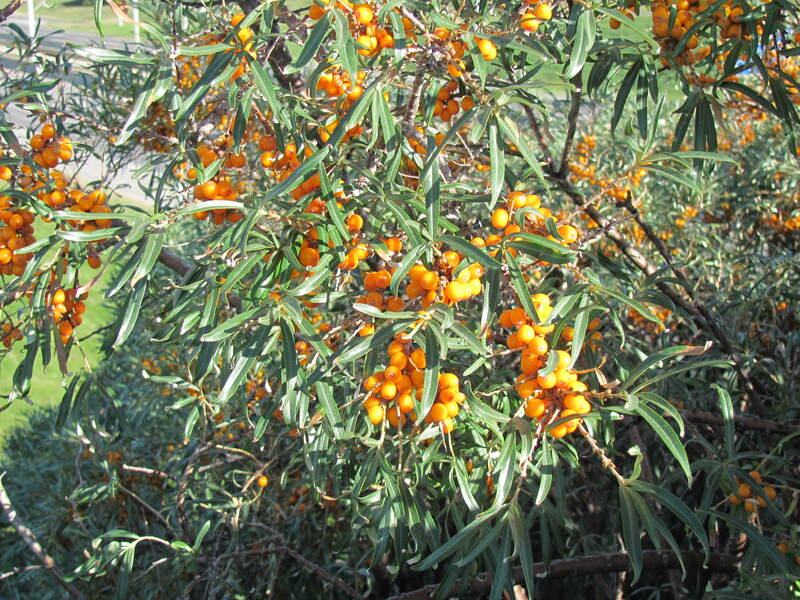 Sea buckthorn (Hippophae rhamnoides) can tolerate a great deal of drought – that’s one of the reasons the City has used them in large-scale plantings – but regular, even moisture promotes better fruit production. There are other reasons sea buckthorn make great urban plantings: they can grow nearly anywhere, in a wide range of soil types, in pretty much any light. They are tough enough to handle our frequent winter freeze-and-thaw cycles and the periods of bitter, prolonged cold. Summer hailstorms hardly knock them about – their narrow, grey-green leaves and their fruit are incredibly persistent (more about that later). They are not fazed by pollution or the nasty (and essential) amounts of road salt we throw down in the winter. Pests and diseases rarely plague them. And pruning is not required (do you want to tangle with those 5 cm long thorns?). And there is the fruit! It’s hard to believe just how nutritious these berries are – they’re filled with huge amounts of essential fatty acids and carotenes and TONS OF vitamin C. I was a bit surprised at how difficult they are to harvest, though – a considerable amount of force is needed to remove them from their stems, and if you grip them too hard in the process, they burst open, spraying orange juice all over your hands. (Apparently the “burst rate” in commercial harvesting is 15% or thereabouts, so I don’t have to blame my sloppy picking skills). The berries are small and sort of slippery, and they hang in tight clusters right next to those vicious thorns (one of which found its way into my thumb this morning). They are tart and citrusy when eaten fresh – most of the time, they’re found in processed products such as juice, beer and preserves. At the moment, I have a pot of berries and water simmering on the stove, which I will eventually mix with sparkling water for what will be a refreshing cold beverage on this hot late-summer day. And although I didn’t pick any leaves – they’re too mature at this time of year – they can also be consumed as a tisane. For all of sea buckthorn’s amazing properties, however, it does have some drawbacks, the largest being its rhizomatous root system and propensity to sucker like crazy. This can be highly useful when the plant is grown in shelterbelts or to control erosion on slopes, but it’s not necessarily a great thing for the home gardener, unless you’re prepared to maintain control of the extra plants. (Consider, however, how many other types of plants also propagate in the same manner and are still highly valued as ornamentals or food crops). 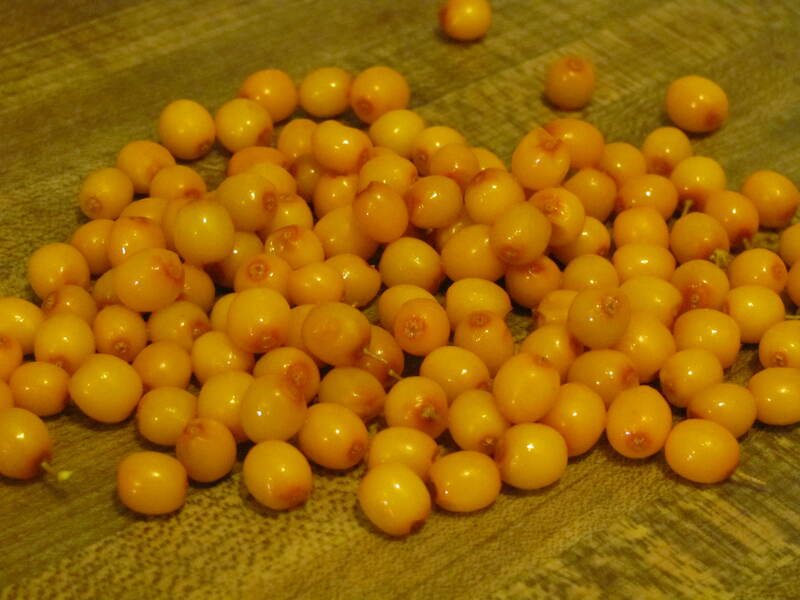 With the potential for such a fantastic harvest, who wouldn’t want to grow sea buckthorn? 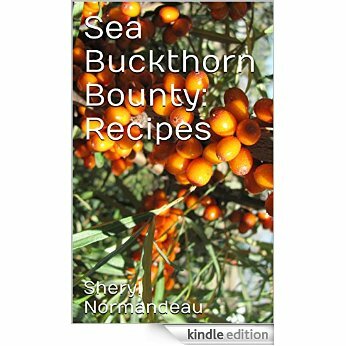 My sea buckthorn recipe book, Sea Buckthorn Bounty: Recipes is now available! Go to my Store to order your copy! If you'd like to keep up with the happenings on Flowery Prose, click to subscribe and receive notifications of new posts by e-mail. 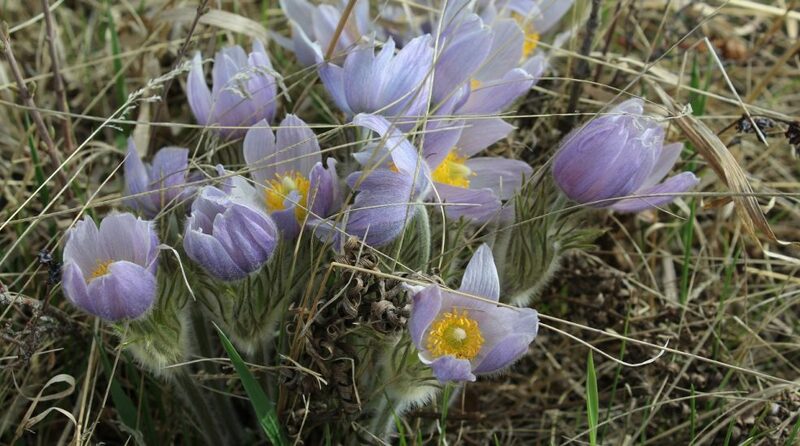 Follow Alberta Gardening on Facebook! Open call for submissions of flash fiction! Nancy Brewka-Clark – Love & the Underdog. Gregg Chamberlain – Poetic Licence. © Sheryl Normandeau and Flowery Prose, 2010-2018. Please don’t copy anything I’ve written or photographed without my consent. (Credited links are great, though). Thanks for respecting my work!